This is the kind of question that grabs my attention. My immediate excitement is slowly tempered by a disconcerting thought in the back of my mind, which grows exponentially until it fills my head. Since being born in Glasgow 27 years ago I have spent the intervening time unaware that somewhere in the city there is a giant stone cow. Surely there can be only one explanation, it’s not a very good cow, or a very big one for that matter, not if I don’t know about it. I had to find out the truth! 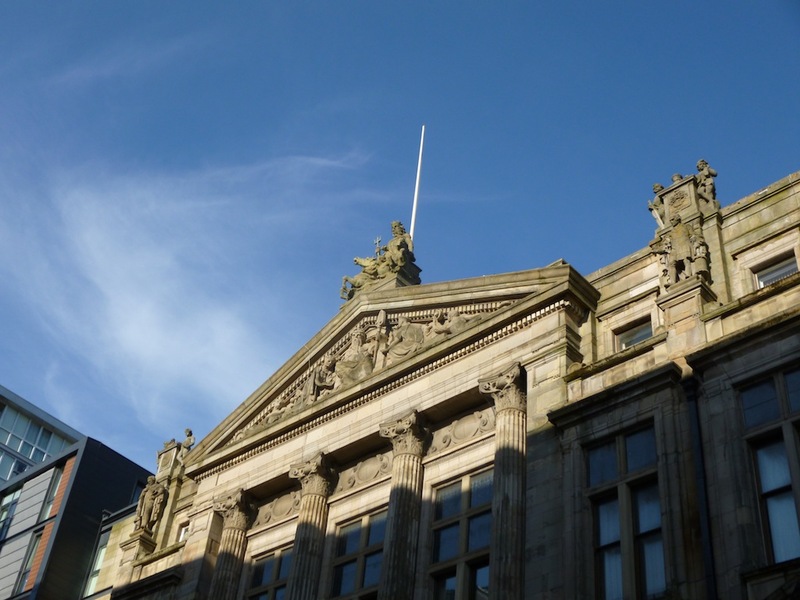 So off I popped to the corner of Robertson Street and Broomielaw to have a gander at the Clyde Navigation Trust building (now known as the Clyde Port Authority building) with great certainty that I’d be able to carve a better cow than the tiny one hidden away on this facade. Turns out it is a very good cow (well a bull to be exact), and I – as has been confirmed by numerous previous sources – am an eejit! 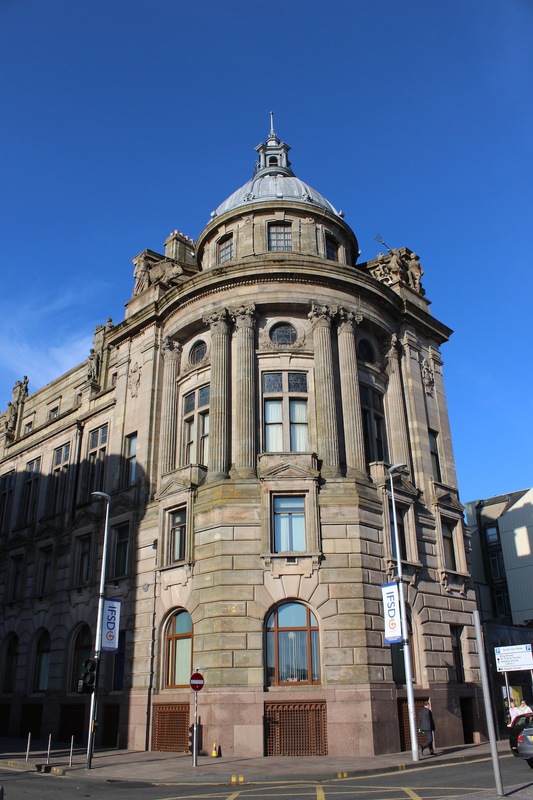 Designed by Sir John James Burnet and initially completed in 1886, with the corner added in 1905, the building was built for the Clyde Navigation Trust who at the time were considered to be as powerful and influential as the city council and wanted a building that reflected that. The Trust was formed in 1858 to continue the ongoing dredging and improvement work that was required to make the river accessible to ocean-going ships as well as managing and developing the business of the Clyde, allowing Glasgow to become a major port and the ship-building industry to massively expand. Due in part to the work of the trust by the early 1900’s the shipyards of Glasgow had constructed one fifth of all the ships globally in use at the time. JJ Burnet’s design brings together elements of Beaux Arts, Renaissance and Baroque to create a composition that, had it been completed, would have rivalled the City Chambers in size, which began construction the same year (JJ Burnet had also entered a design for the City Chambers that was unsuccesful). Sadly, as only two of the four planned stages were completed the result is a building that is expectedly unbalanced. The elaborately detailed pediment, crowned by John Mossman’s sculpture of Poseidon, should have been at the centre of an asymmetric facade, however the inability to secure the land to the north for the later stages means that the intended central element now serves as a slightly uncomfortable end to the elevation. In 1905 the second phase of the construction, the junction with Broomielaw was completed as a baroque cornerpiece, however an elevation published in “The Architect” in 1888 shows that Burnet originally intended this extension to be much more Venetian in style with a proposal for a campanile, comparable to the clocktower of Piazza San Marco. Following this, as the intention to expand north on Robertson Street and complete the main facade was proving impossible, a third phase was drawn up that would have expanded the building out along Broomielaw potentially if also asymmetric providing the balance the overall composition requires (I haven’t been able to see these drawings yet, I will update this post if and when I can). However, the 1915 plans were suspended due to the outbreak of World War I and ultimately never realised. Now, onto the constructed building. 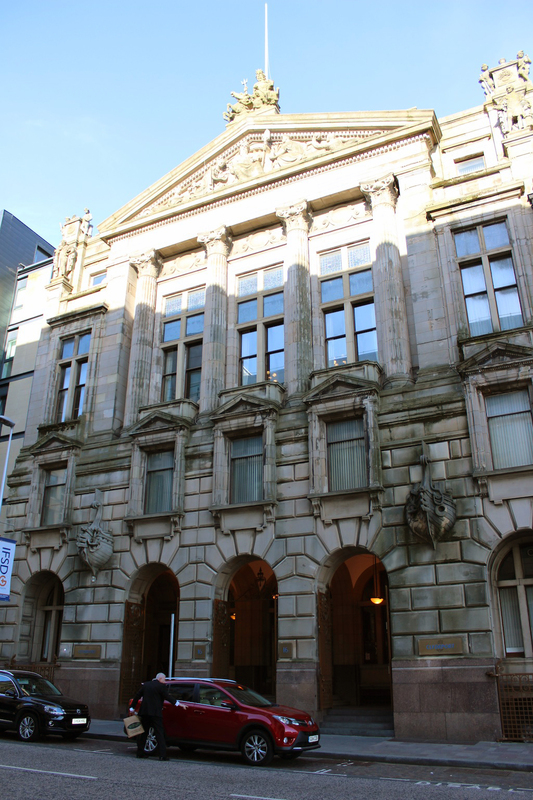 The first phase of the building was the temple-fronted section facing onto Robertson Street. This was constructed as a symmetrical composition with one bay either side of the three-bay entrance capped by the central pediment. The arrangement of materials reflects Burnet’s training at the Ecole des Beaux Arts beginning with a base course of polished granite, rising to an extended first storey of rusticated stonework with ashlar continuing above. Three central arches conceal a vaulted entrance loggia at ground floor level, these are bookended by two protruding mouldings of ships prows introducing the nautical theme of the Mossman work on the building, reflecting the Beaux Arts ideal of using sculpture to represent the identity of the building. The first floor feels almost consumed by the ground floor and is squat in comparison to what is above and below, serving almost as a plinth to the temple front above. Windows with Palladian pediments and associated intricate dentel moulding rise beyond the rusticated stonework, framed by heavy mouldings that combined with their height give them a strength, almost as though they are holding up the massive second storey. The tall windows of the second storey are separated by fluted, composite order columns that support the pediment, whilst the freize within the entablature is blank, a decorative panel has been introduced behind the capitals of the columns. 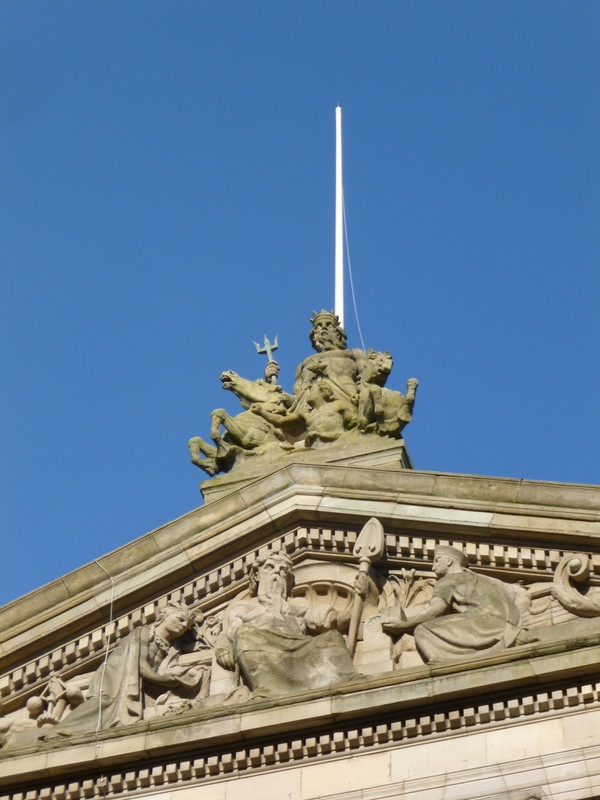 The elaborately sculpted allegorical pediment supposedly depicts an enthroned Father Clyde, a character previously depicted in a building by JJ Burnet’s father, John Burnet, as a personification of the river itself (you can read more about Father Clyde here). The original composition is surmounted by a spectacular sculpture of Poseidon (or Neptune depending on whether you go for Greek or Roman mythology) riding in a chariot drawn by a pair of seahorses, with his son Triton in front. The wee chubby children, or Putti to give them their correct name, that bookend the pediment are also credited to Mossman. 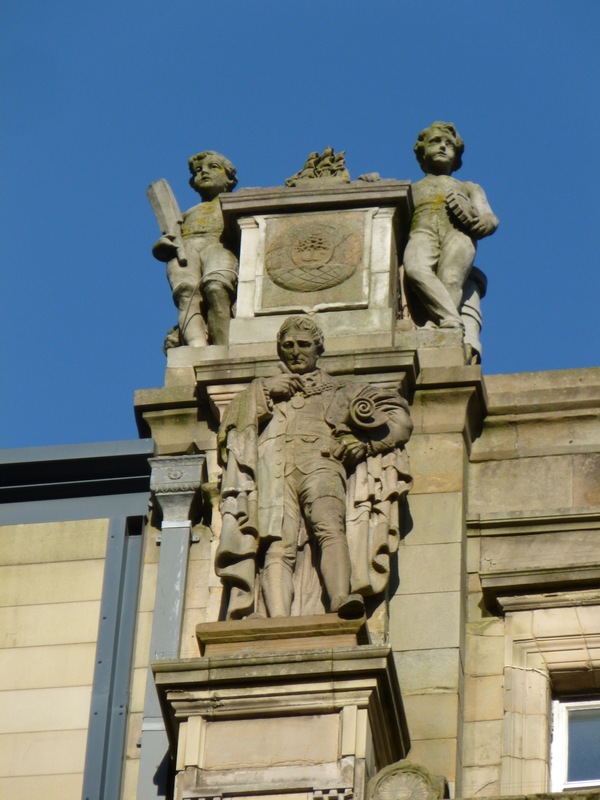 The figure sculptures of Thomas Telford, James Watt and Henry Bell were added later by Albert Hodge as part of the second phase of construction. Burnet added 4 bays to the Robertson St elevation before introducing a drum, topped by a dome and cupola, that turns the corner onto Broomielaw. This second phase was completed following a study trip Burnet took to Italy in 1895 to further his understanding of baroque. The ground and first floor of the extension follow the same pattern as the first phase and are chamfered at the corner. At second floor Burnet takes the same columns but pairs them either side of the central window, whilst instead of increasing the height of the windows below the entablature as below the pedimented section he introduces porthole windows, suggesting Burnet’s continuing belief that he would get to complete the Robertson St elevation and the pedimented section would be central and architecturally most important. Above the entablature that drum steps back, where the windows are broken down into smaller panes, the keystones of which support the cornice of the dome. 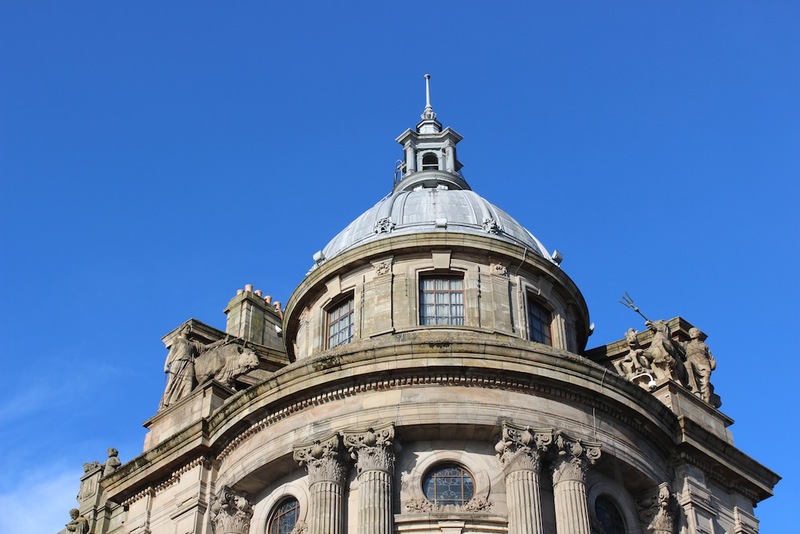 The dome features small grotesques that line in with the heads of the pilasters on the drum, and is topped by a cupola that forms the pinnacle of the building. The second phase took place following the death of John Mossman in 1890 and as a result Albert Hodge was brought in as his successor. His two giant sculptures rival Mossman’s Poseidon in scale, to the right of the dome is Poseidon’s wife Amphirite also shown with seahorses and her trident. To the left of the dome is the bull being led by Demeter, the goddess of the harvest, a departure from the nautical theme adopted in the rest of the mythological depictions on this building. The other figures completed Hodge all also had a relevance to the river or shipping with Henry Bell establishing the first steam-powered passenger service in Europe, James Watt being responsible for refining steam engine technology, and Thomas Telford having carried out the design of the Broomielaw Bridge. 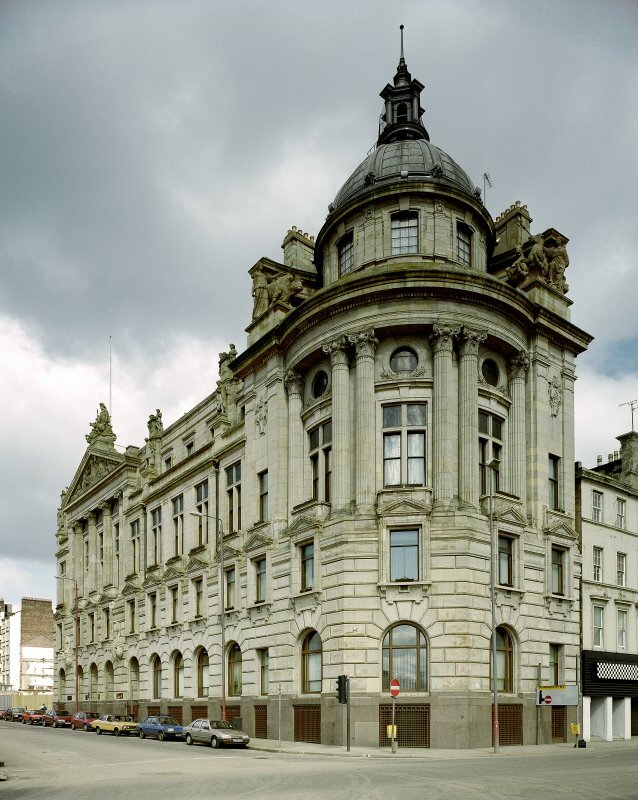 This is a fascinating building who’s occupants played a huge role in establishing Glasgow as an industrial powerhouse. 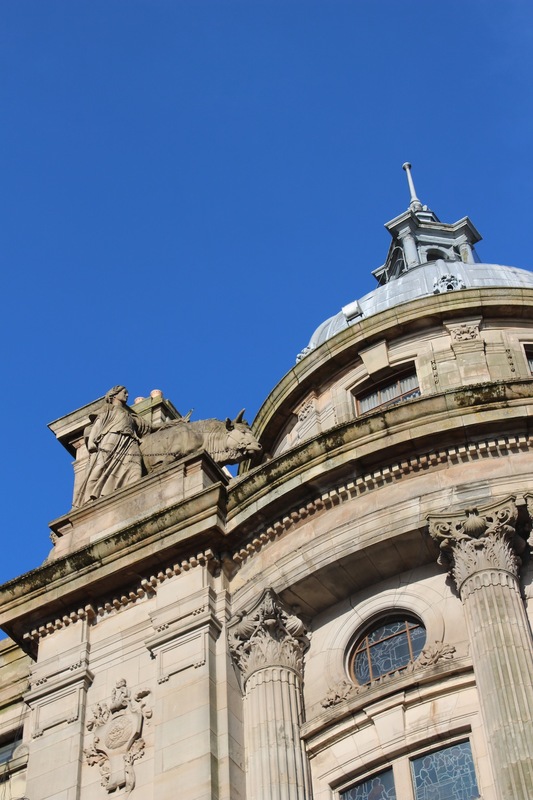 Architecturally the building represents the earliest surviving building by JJ Burnett and plays host to a fantastic array of sculpture by two of the best sculptors to work in the city. The interior of the building merits a post of its own if I can get access during a future Doors Open Day, described as they are in Central Glasgow: An Illustrated Architectural Guide as “among the most sophisticated in Glasgow”. A few images giving an insight into the quality of the interior spaces can be found here and here. To view the Historic Scotland listing for this building click here. We saw inside here on a Doors Open Day many years ago. What surprised me in your post is that there is a statue of James Watt. I didn’t know that. I’m hoping its on this years list of participating buildings, really keen to see inside now that I know a bit about it. Glad there was a wee bit of fresh info in there for you!